They do exist! Tenkara hooks! Designed specifically for tenkara. Do you absolutely have to have them? Of course not. You can use any hook you want. However, just as rods were designed specifically for this type of fishing, and lines were designed specifically for this type of fishing, there are indeed hooks designed specifically for this type of fishing. 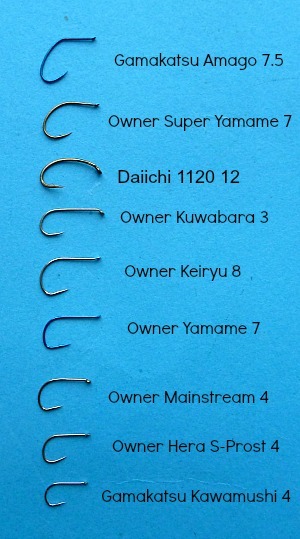 Owner, a well known maker of hooks in Japan, has hooks that they label as "Tenkara" or rather as テンカラ. Or, to be a bit more precise as 本流テンカラ, or Main Stream Tenkara. International shipments require additional postage. Please click on the appropriate button at the bottom of the page. The Main Stream hook has a shorter shank and a very wide gap - although not nearly as wide as some of the bait hooks that we've all seen tenkara flies tied on. The point is angled up to provide positive hooking. It has a micro barb and a very slightly turned down eye. The Owner Main Stream hook has a slightly different shape but is about the same size as the size 14 Daiwa 1130. Some tenkara anglers in Japan use keiryu fishing hooks for tenkara. 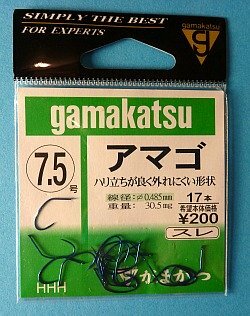 Most of the keiryu fishing hooks in Japan are eyeless, so anglers who do use them for keiryu fishing must snell the hooks. Tenkara anglers construct an "eye" using either silk cord treated with persimmon or nylon mono fishing line as the first step in tying their flies. Some anglers here use the hooks out of a sense of tradition - trying to keep true to their understanding of tenkara in Japan, but there is also a very practical reason for using eyeless hooks and tying in the eye when you start the fly. You can make the eye huge (at least compared to a regular hook eye). That makes it infinitely easier to tie on a fly if your eyesight isn't what it used to be, or if your hands are no longer as steady as they once were. For that matter, even for those with sharp eyes and steady hands, at dusk, flies tied on eyeless hooks will be much easier to tie onto your tippet. The Gamakatsu "Amago" hooks may look a bit strange, but it seems a many tenkara flies in Japan are tied on bait hooks like the Gamakatsu Amago or the Owner Yamame. It is said that the hooks provide more positive hook ups because the tippet is attached to a flexible eye fashioned from silk cord or a bit of mono rather than a hard hook eye. These are barbless hooks, but because of the shape, or the flexible eye, or possibly a combination of both, they hold fish better than the standard barbless "J" shaped hook. A while ago I got in some "Amago" hooks made by Gamakatsu. Well, it turns out there are "Yamame" hooks as well, although these are made by Owner instead. Like the Amago hooks, the Yamame hooks are eyeless, and like them, they are also bright blue. These hooks have barbs. 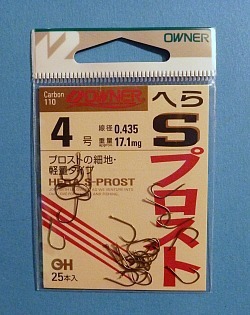 Owner Hera S-Prost hooks are eyeless, barbless hooks that are just a bit larger than the Gamakatsu Kawamushi hooks and just a very little bit smaller than the Owner Mainstream tenkara hooks. The point is turned up a bit and reminds me of the European competition nymph hooks. Gamakatsu "Kawamushi" hooks. 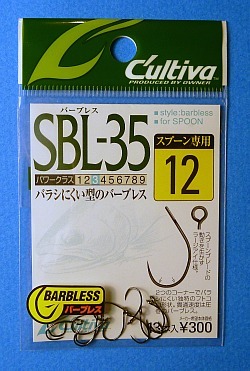 These are eyeless, barbless hooks specifically designed for nymph fishing - that's fishing with live nymphs collected from under rocks in the stream you are fishing. I have read that barbs on hooks were initially developed not to keep the fish on the hook, but to keep the bait on the hook. The problem with baits as delicate as live mayfly nymphs is that the barb just destroys the nymph. On these hooks there is a flattened section just behind the hook point - designed to hold the bait without creating such a large hole that the bait is destroyed. Similarly, they should help in holding fish without creating the damage that is caused by pulling the barbed hook back out. 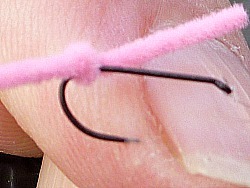 They are a Japanese size 4, similar to the Mainstream hooks (above) but the gape is not quite as wide. If you are looking for smaller, eyeless, barbless hooks these may be just what you are looking for. 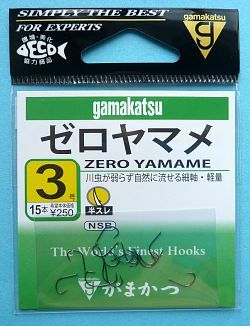 The Gamakatsu Zero Yamame Eyeless Hook is one Craig Thoreson found, and found to be perfectly suited for fishing salmon eggs with his Zero Tension keiryu rods. I have found them to be equally effective when used with a red wiggler. 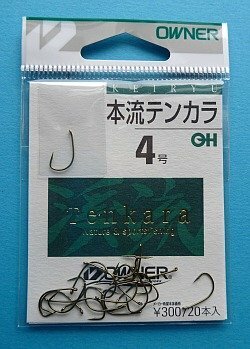 I don't know of anyone (yet) who has tied flies with them, but I am sure they will prove to be ideally suited to small sakasa kebari. There was a question on one of the Facebook tenkara pages recently about why everyone used size 12 hooks to tie kebari. The basic answer pretty much was that they work. However, we all know that not all flies are the same size and sometimes the fish are looking for smaller flies. 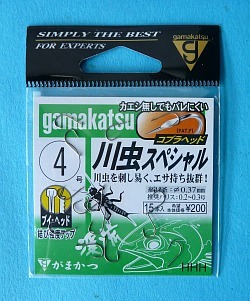 The Gamakatsu Zero Yamame size 3 hooks are a bit smaller than the Gamakatsu Kawamushi size 4 hooks. There is no direct western equivalent to the size and shape of the hooks, but they would be roughly equivalent to a 3X short size 14 (the shaft length of a 20 but the gape of a 14). They are a fine wire hook with a micro barb and are incredibly sharp - all for ease of penetration, which makes them the ideal hook for fishing a zero tension set up, where you have a soft rod and a very light tippet. 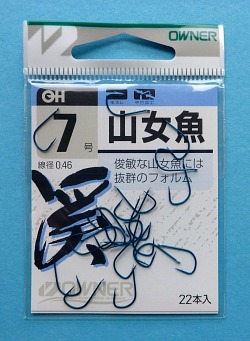 They will do equally well with the seiryu rods and tenkara rods when smaller flies and lighter tippets are called for. 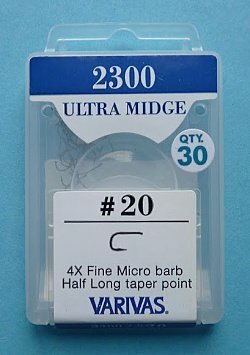 The Hera S-Prost, Kawamushi and Zero Yamame are nice hooks, but I have pretty much settled on the Varivas 2300 Ultra Midge size 20 for my keiryu fishing. There are three things I like about the hook: 1. it has an eye, which makes it easier (for me) to tie it on the line, 2. it has a barb, which makes it easier to keep the worm on the hook, and 3, it is a very small hook and I think the fish don't even notice it until it is too late. 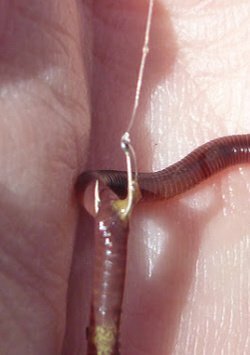 Red Wigglers are small worms, but I truly believe that is a major advantage over night crawlers. Trout are used to eating small things, and there is a much better chance that a trout can get the whole worm into its mouth if it is a small worm. If it gets the whole worm in its mouth, you can be sure it also has the hook in its mouth. I hook the worm just once, crosswise, which allows each end to wiggle enticingly as it drifts down the stream. Wide-Eyed Hooks™ are for anglers who've gotten to the point where it is a bit difficult to thread the tippet through the hook eye. If you've ever wondered why they don't just make the eye bigger, boy do I have hooks for you. The eyes on these hooks are huge! If you'd like to have the benefits of a larger hook eye without having to tie a loop eye on an eyeless hook, these hooks are for you. I had a box of 20 packages with me at a recent Sowbug Roundup, which is a fly tying demo that brings tyers from around the world. The tyers on both sides of me bought some of the hooks, and before the Roundup was over I had sold every last package. The hooks are a size 12 (western sizing, not Japanese sizing), which is probably the de facto standard for tenkara flies. They are barbless but the shape should prevent all but the littlest, squirmiest fish from wriggling free. The Gamakatsu R10B is a hook with a very unusual shape. It looks like the perspective is all wrong, but it is a very nice hook for the Overhand Worm. The strange looking bend keeps the knot of the worm well away from the hook point and the knot doesn't close off the gape at all. Also, these hooks are extremely sharp and it is easy to get good hook sets. The Retainer bend (what the R stands for) works! I have not lost one fish (yet) hooked with one of these hooks. The hooks are barbless but they hold very well. These are hooks intended for the Japanese domestic market. The eyeless hooks are roughly equivalent to a wide gap size 10 or 12 fly hook. The shape is radically different so it is hard to make a precise comparison. Does size matter? If you are not matching the hatch it doesn't matter much. I've caught trout on tanago hooks and on size 2 sakasa kebari. Just about anything a fish can get in its mouth may be considered food - particularly if it is (A) moving and therefore alive, and (B) getting away! 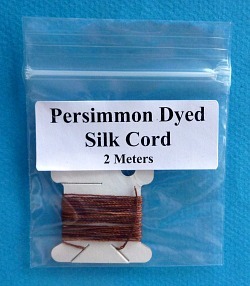 If you are tying on eyeless hooks, use persimmon dyed silk cord for creating the loop eye. When Amano san ties his flies on eyeless hooks, he first ties on a loop of silk cord treated with persimmon, which dyes it to a reddish brown color and also makes the cord a bit stiffer, so the loop will be less likely to twist or collapse. Now available in the US. 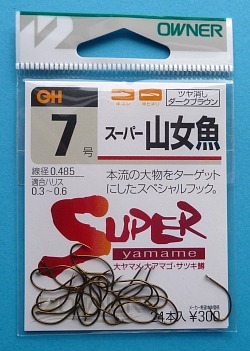 I really like those Yamame Super hooks. Some of the best I have used, nice size, thin, very strong.